Au-delà des images...: INVENTORY CHALLENGE No. 18 - LAYER -IT ON, Romeo and Juliette reinvented. INVENTORY CHALLENGE No. 18 - LAYER -IT ON, Romeo and Juliette reinvented. OH! Romance is in the air this morning. I have recreated the classic Romeo and Juliette balcony scene, to suit the newborn love story between Tilda and Edwin, that takes place under a window, that Tilda cannot open. She is awaiting her Prince Charming, locked in her room by her mean step-moter. She is longing for her sweet Edwin to find a way to rescue her and take her away. Here comes Edwin, but instead of a ladder he carries a rose. What is the plan the young man has in mind to rescue his sweetheart... Valentine's day is coming, and we can all imagine a happy ending for this story! It's not only Romance that is in the air, Christina and I are featuring our 18th Inventory Challenge, quite a simple one today: layers. No prrrroblem for me anyway, I love layers. And my card has quite a few! I hope you will be inspired to put romance in your weekend! My adventure with this card, started a fews weeks ago, when rummaging through my ribbons. I had my hands on this wondeful vine, a gift from dear Christina at Chrismas, I still had not used it. So, I left out, on my desk, sitting there and waiting for the inspiration. 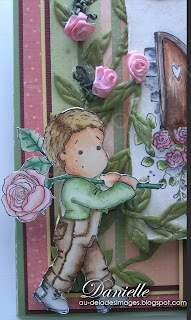 I just knew what I wanted to do with it, when I stamped the very romantic window of the new You are so special collection... I have to admit it took me all week to put the pieces together and find a way to make the 3-D look properly. I used foam sheets under my image instead of 3-d dots, in order to get the proper height! I had fun and hope you will like. We have the pleasure of welcoming a new participant in our challenge this week, Jean. So, grab yourself a gooooood coffee or a nice tea, and hop to my dear friend and team-mate Christina, and follow your way to the other members of our team. Il y a de la romance dans l'air ce matin... vous vous préparez sans doute à souligner la St-Valentin, chocolat, surprise, un peu de piquant dans le quotidien quoi. Je me suis dit que Tilda ne pouvait passer cette fêtes des amoureux sous silence, j'ai donc revisité la scène classique du balcon dans Roméo et Juliette, style Magnolia! Tout a commencé avec un remue-ménage dans mes rubans. J'ai mis la main sur cette magnifique vigne en soie, cadeau de Noël de ma chère amie Christina, avec laquelle je n'avais pas encore jouée. Je l'ai donc sortie du tiroir, et installée sur ma table... elle y était depuis 2 semaines, lorsque dimanche dernier, j'encrais mes nouvelles étampes, et j'ai vu la scène. Restait à monter le tout. Je ne vous cache pas que j'y ai travaillé toute la semaine! Afin de monterles pièces en 3-D,d'une manière appropriée, j'ai utilisé de la créa-mousse. J'espère que vous cette scène vous invitera au romantisme. C'est aussi vendredi, jour de notre 18e Inventory Challenge, ayant pour thème, "layer-it-on", des étages!!!! en mauvais français. 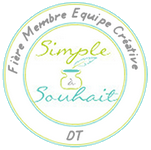 Il me ferait plaisir que vous alliez faire une visite à toutes mes compagnes, j'ai lié leur noms ci-haut, à leur adresse de blogs. je suis certaine que vous découvrirez des super créations, et des idées originales pour almenter votre inspiration. Bonne visite. Tilda, and Edwin were colored wih copics. Part of the wall also with copic. The shutters were painted with acrylic metallic paint, mixed with ink. My flowers were sprayed with "home-made glimmer mist", I used a part of water, a part of alcool, and added drops of SU Pink Pirouette, Bravo Burgendy and a small amount of Perfect pearl. I used my favourite SU shade: Cherry Cubbler to stamp "je t'aime" and embossed it with clear powder. Fantastic card!! So many details and done so well. The effect you created on the shutters is amazing. Oh Danielle, tout à fait superbe! L'idée de la vigne avec les petites roses...vraiment remarquable. Les couleurs de Tilda et Edwin sont des plus réussies. J'aime beaucoup ton poinçon "Coeur", il est très original. I am loving this wonderful scene you created...it is a true work of art, my friend!!! You are so creative and your coloring of Tilda and Edwin is phenomenal. B-E-A-U-T-I-F-U-L! OMG what a precious little card and you have done it so well! What a great idea for that little Edwin I will have to put this in the book of must do's ....Just amazing the creative mind you have. a fantastic card, thats great. Absolutely adorable. Just love it. Wow, what a wonderfully creative card! Love everything about it....great job! A true work of art Danielle....fabulous creation. Such a gorgeous scene you created Danielle! Great idea to cut out the windows! LOVE IT Danielle! Awesome idea! oh la la Danielle, quel travail, c'est impressionnant et magnifique! OMG, Dani! This turned out so gorgeous! What a super cute idea to have Tilda behind the window and Edwin on his way to rescue her. You even added the vine for him to climb. BEAUTIFUL work!!!!! What a gorgeous scene! Beautiful Danielle! Love it! Wow Danielle! What a gorgeous card! I love it! And love your cute little romantic story. Cute, cute, cute! I have that vine too & now you've inspired me to get it out & use it somehow on a card. Thanks for the inspiration. 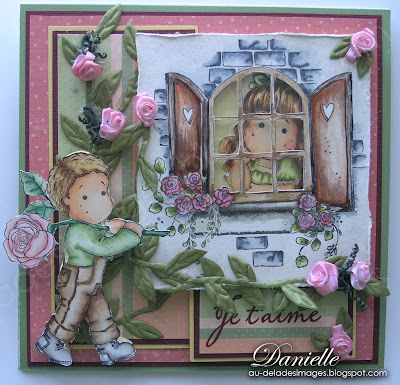 Danielle, this is such a gorgeous scene, one just out of a fairy tale book.. you did so well with your window, never know it was hand drawn.. great job.. and love Edwin below waiting with his rose.. beautiful job.. gorgeous colors and coloring.. love the inside just as much..
Danielle, you have the most beautiful style. This card is so sweet and elegant. 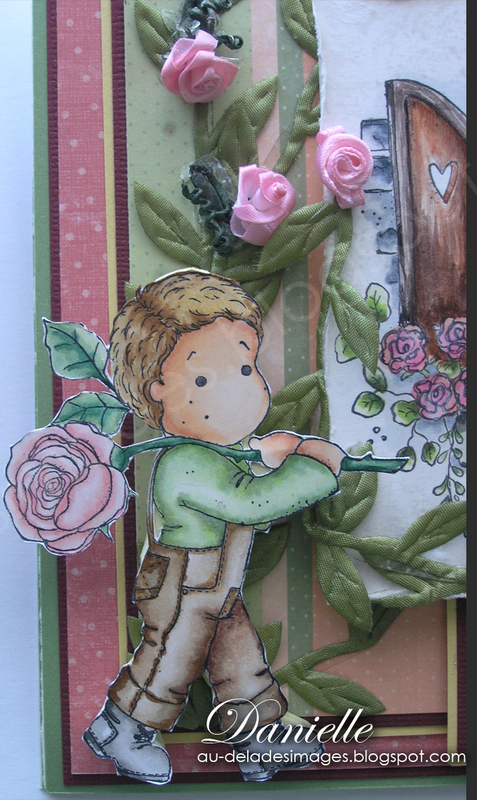 Perfect use for Edwin and Tilda and loving the tiny pink roses. Oh my gosh Danielle this is beyond words but I will try...absolutely amazing, stunning, beyond gorgeous. You have achieved the perfect balance between the two figures. I love the cut out window, perfect. I can see how the vine was the inspiration piece. CardART my dear!! This is gorgeous Danielle! I love the scene you created. 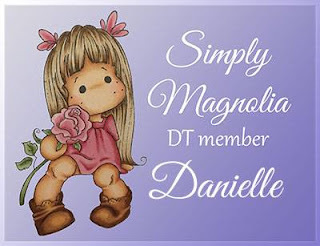 Hi Danielle, Every week you produce outstanding results for the Challenge!! This week is no exception. WOW!! This card is phenomenal!!! EVERYTHING about it is OUTSTANDING!!! I Love it!! I Love You Too!!!!! I think you know I love scene cards best of all - your mind just has to create a story to go with the scene - now I wonder who is courting who - Seems like Tilda is watching Edwin wishfully and Edwin doesn't seem to notice. I love this card -- the coloring is fantastic the papers divine! Such a sweet scene and beautiful card! OMG Danielle, this is beautiful! 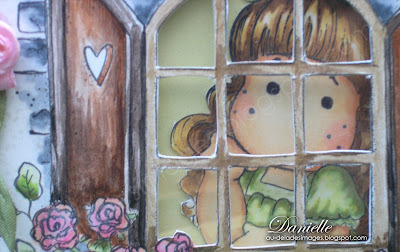 Love the scene you created and love Tilda behind the window! Great card! It's just fantastic! So many lovely little details. bravo!!!! j'adore ta carte et la scène est splendide wow!!! on dirait même qu'on entends la sérénade!!! bravo ma belle! DANIELLE!!!! OMG! This is INCREDIBLE! Wow! I am blown away by this scene you've created (not to mention your wonderful love story! hehehehe!) Oh my .. this is just .. jaw droppingly GORGEOUS! Whewwwweee! Oh my gosh!!!! Danielle!!! I LOVE this card!!! You are sooo creative and talented! I love the scene you have created and your coloring is so beautiful! Fabulous, fabulous, fabulous!!!!!! J'aime vraiment l'idée du balcon de Roméo et Juliette. J'espère que l'histoire de ta carte finira mieux que la vrai. OMG Daniele, this is fantastic! Your card is breathtakingly beautiful! Every time I visit your blog you come up with something which blows me away! Great coloring and masking job! Gosh, I should sit down and try something as elaborate as this! Great work! Upon a closer look I saw the cutting work with the window bars.So you haven't mask it as I thought first. It's even more complicated with cutting and all. You really have a lot of patience to work on such tiny details. The result is great! over the top creative Danielle! I LOVE it! Thanks for the close up of Tilda behind the window... just sweet as can be!